Some people buy pencils or postcards for souvenirs. 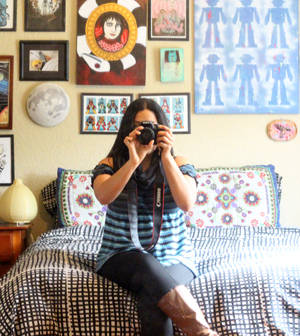 I scoop up necklaces for visual representations of my various adventures! Each one is a reminder of a time, place, or event. 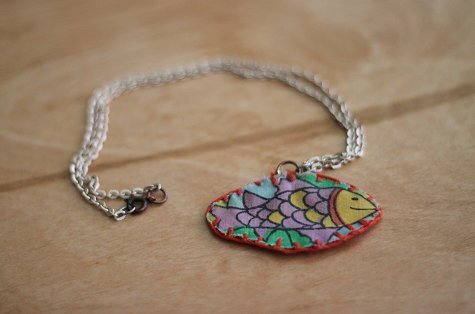 The interesting flower and seed necklace was purchase during my last visit to Puerto Rico. I bought it from a small museum that's near my grandparent's house. The flower is made from coconut! 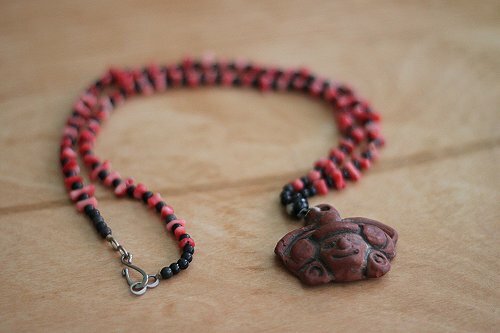 This artsy red necklace was purchase from an art boutique where I used to sell some photographs. It's was cozy and bright with a cafe in the back, too bad it's out of business now! 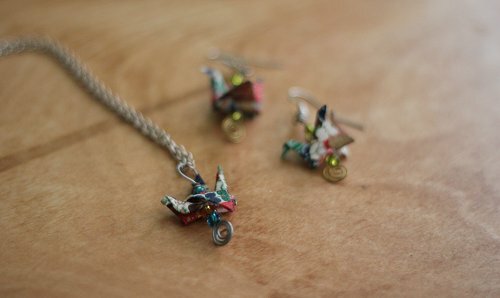 Origami necklace and earring set! 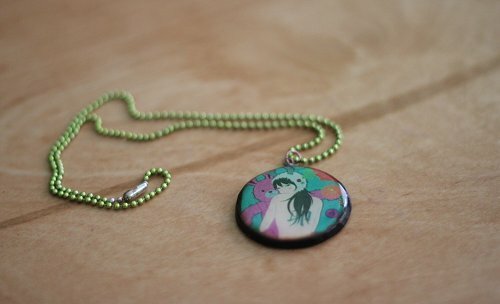 From an anime con, along with a makona necklace those in the know can easily spot in the first picture. I made this during a fun week craft night I used to go to. The fish is cut from vintage fabric, he's blanket stitched to some bright orange felt for support. First blogged about here (where you can see a better picture). Purchased from Jacksonville's Downtown Art Walk from an artist I admire. I purchased this from a annual local event World of Nations from the Mexico booth. I was in my junior year of high school, and the field trip was a pleasant respite from school. 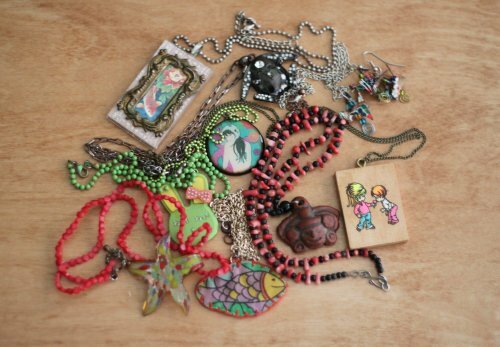 Does your jewelry bring back fond memories? Does it tell your story? 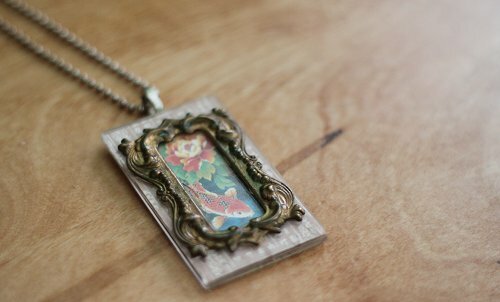 i love the koi necklace, and the puertorican coconut flower? thats cute! 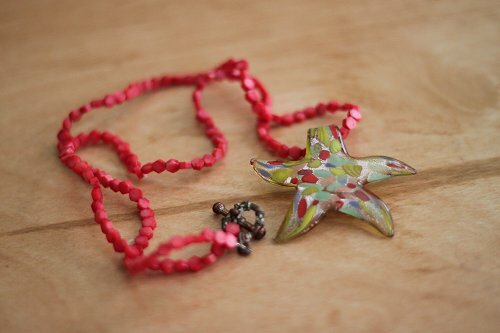 i love the glass star necklace and LOVE the one you made with the koi fish. beautiful! my husband and i do something similar when we travel, we pick up christmas tree ornaments wherever we go. it's so cool when you're decorating your tree each year to see each ornament and be reminded of your traveling experience. i have bells from cambodia made from recycled bombshells, i have a set of onion-top churches from ukraine, i have a whole set of maritime themed ones from our trip to PEI and Nova Scotia, a statue of liberty from NYC and tons more. 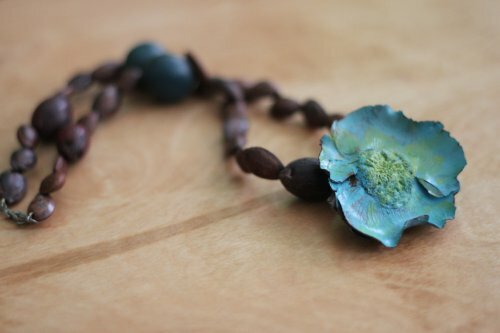 the blue flower is also lovely and actually reminds me of the British Columbia provincial flower: the dogwood. Dogwoods are usually pink or white but it looks pretty cool in blue too! Miss Lou: That one is a favorite, it came with matching seed earrings. The brown "beads" are seeds! Angelika: That's an excellent idea for a collection! I love the thought of bells from Cambodia made from recycled bombshells! 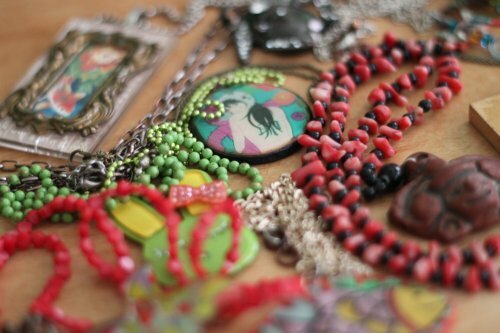 Lovely necklaces! I too love unique, and not necessarily expensive or trendy jewelry. (Though Betsey Johnson's designs are fun). I bought this really neat necklace last year from an antique shop in New Hope, PA. It has a beige glass elephant (who I lovingly refer to as Stompy) on a double layered long gold chain. It doesn't work for every outfit, but it sure does look cute with the right style shirt. Since I was also buying a pair of vintage earrings for my sister, "Stompy" was given to me at half price! Love him! 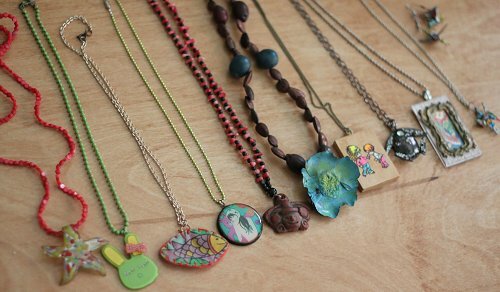 what great necklaces maybe you could have little story attached to each one for future generation referance? Fantastic collection! I collect jewelry from different places I've been... when I was in Europe it was much easier than buying something large and lugging it around! Nelly: That's actually a great idea! Eef: Exactly! Huge souvenirs are amazing, but I'm into light-packing! but there are lots of spots that it is possible to visit quickly and easily get all in the fashion thing you may need. same and we don't all need to be a size 6 or smaller. some advantages. • Must know how to assess injury risks that comes with hazardous manual handling.